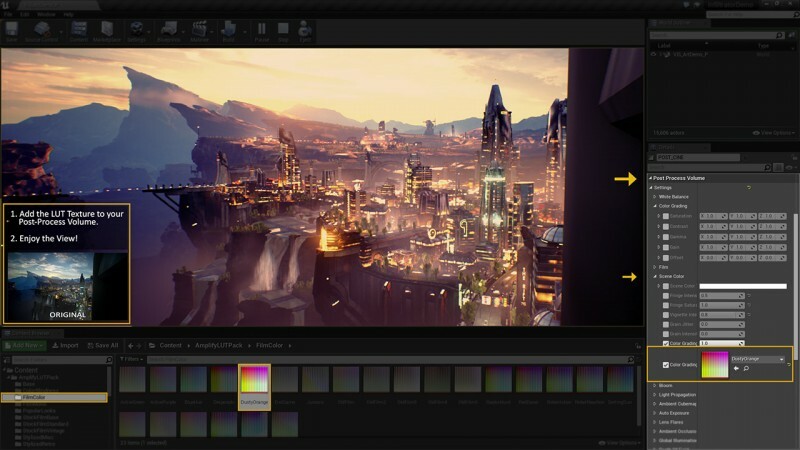 The Amplify LUT Pack offers over 200 high-quality LUTs in a comprehensive and varied pack for UE4, ready to use and extremely simple to add to your project. It’s a great addition to 3D and 2D applications, altering the overall mood or style is only a few clicks away. From basic exposure and tint adjustments to elaborate film like color grading usually associated with popular films and video-games, you will find an extensive array of grades suitable for almost any type of project. LUT textures allow you to instantly alter the mood of your levels by simply adding them to the color grading slot located in post-process volumes or camera effect parameters.